The chief of FEMA says Hurricane Irma is "going to devastate the United States," according to Reuters. FEMA also says electricity in parts of Florida will be out for days after Irma hits. The NHC says Irma is about 450kms southeast of Miami, with maximum wind speed of 150mph. 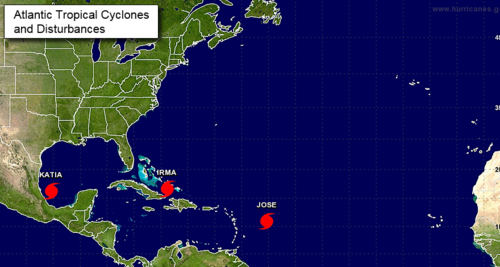 It says the core of the hurricane is forecast to move between the Bahamas and Cuba today and Saturday. 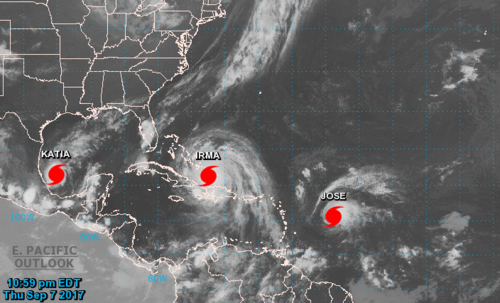 The National Hurricane Center (NHC) says Hurricane Irma is about 495 miles southeast of Miami with maximum sustained winds of about 155 miles per hour. It is currently a category 4 hurricane after being downgraded from category 5. The NHC continues to describe Irma as extremely dangerous. 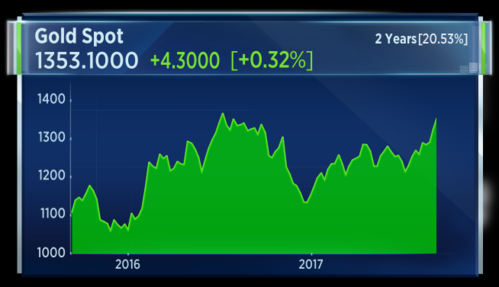 The euro has hit a 2-and-a-half year high against the dollar as ECB president Mario Draghi says the central bank could outline its taper timeline in October. 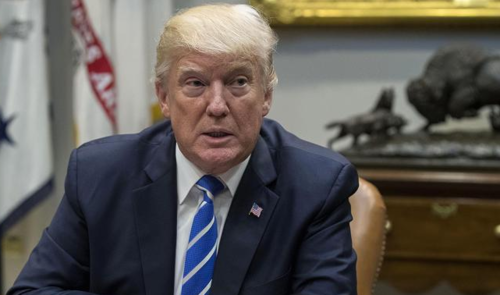 President Trump declines to rule out military action against North Korea amid fears Pyongyang could use its National Day this weekend to launch another test missile. French President Emmanuel Macron uses a trip to Greece to call for deeper euro integration and more help for the bloc's weaker members. Hurricane Irma claims 14 lives as it hurtles through the Caribbean islands, while hundreds line up for water and fuel in Florida, ahead of landfall this weekend. 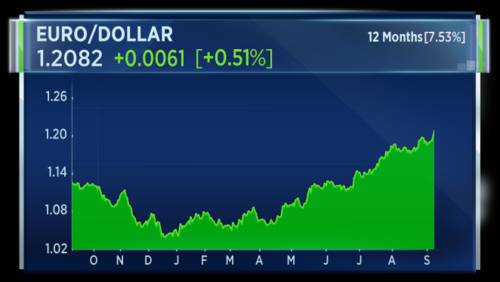 The Dollar Index has hit is lowest level since January 2015. The dollar lost ground against the euro which has been boosted by investor belief that Mario Draghi is set to lay out the removal of stimulus for the euro zone when he next speaks to press in October. The yen was bid up as investors sought a safe haven ahead of the predicted landfall of Hurricane Irma on the Florida coast. Ongoing tension surrounding North Korea also saw investors depart the dollar. Analysts have predicted a fresh missile test from the rogue state could occur as soon as this weekend. Print taken at 07:51 a.m. London time. The ECB held policy steady in its latest meeting and said the recovery in Europe is still massively dependent on its stimulus program. President Mario Draghi said that decisions on any change to QE would likely be made at its October meeting. Draghi defended the level of bonds bought from certain countries and said he saw no systemic risks coming from continued accommodative policy. The ECB president refused to comment on specific levels of the Euro, but did say the recent strength was the cause for the downward revision to inflation forecasts. He also added that there would be consequences to trade from the higher Euro and it would take close monitoring. 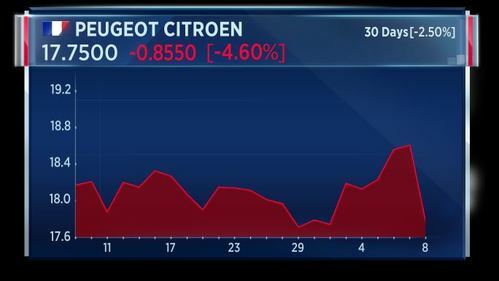 Valentin Marinov, Head of G10 FX research at Crédit Agricole CIB says the market doesn't see a rate hike from the ECB until mid 2019. 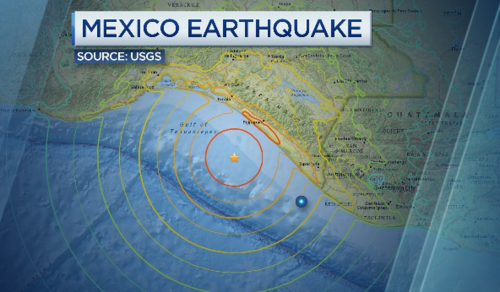 The coast of Mexico has been struck by an earthquake of magnitude 8. A tsunami is possible according to authorities. Buildings in Mexico City were apparently rattled. 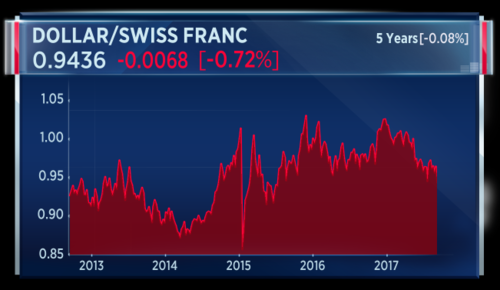 The Swiss franc has just hit its highest level against the dollar since August 2015. "It will be a very sad day for North Korea" if America has to take military action. That's the message from President Donald Trump, who refused to rule out using force at a White House press conference. President Trump is refusing to rule out military action against North Korea. In a new twist, the South Korean government announced this morning that it is seeking a fresh tri-lateral economic co-operation with its northern neighbor and Russia. The South Korean president has also said in the last 24 hours that there will not be a war on the Korean peninsula. More than a dozen people are dead as Hurricane Irma pushes through the Caribbean, with Florida in its crosshairs. 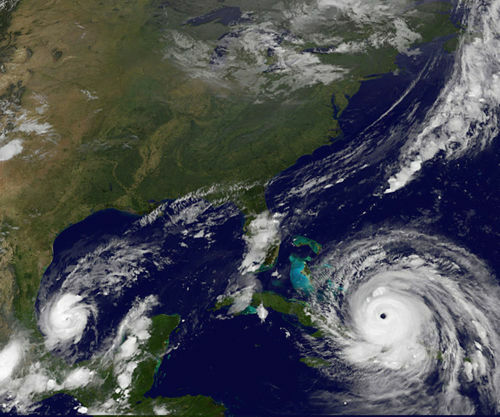 The category 5 storm is roughly the size of France, packing winds of up to 185 miles per hour. The hurricane is expected to make U.S. landfall on Saturday and the race is on to get out of its way. Flights out of Florida are currently very full and roads are snarled up with departing traffic. Demand for water and fuel are also causing queues of hundreds of people. An earthquake of an updated magnitude of 8.2 struck off the coast of Chiapas, Mexico, late on Thursday local time, the Pacific Tsunami Warning Center (PTWC) said, citing USGS data. Scientists now say the Mexican coastline could see waves of up to 3 meters high. 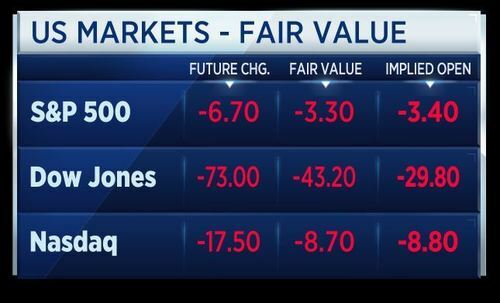 Equities in Asia largely lower Friday as the dollar posted broad losses a day after the European Central Bank putting tapering on the table on Thursday. 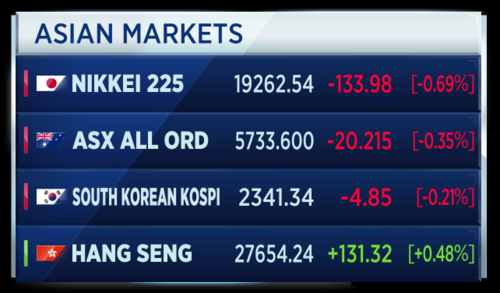 Greater China markets posted moderate gains. The country's exports in August rose 5.5 percent in dollar terms compared with a year earlier. Imports increased 13.3 percent in dollar terms. Those compared with the 6 percent rise in exports and 10 percent rise in imports forecast by analysts in a Reuters poll. 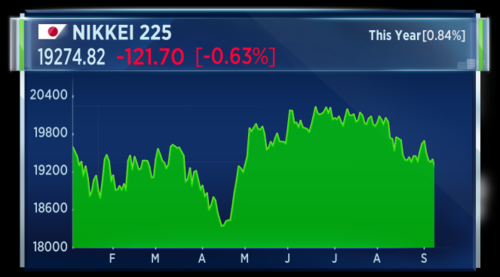 The Nikkei Stock Average has closed at its lowest level since April 28. Statoil has begun making preparations to shut its storage and trans-shipment terminal in the Bahamas ahead of Hurricane Irma. That's according to Reuters. The South Riding Point terminal has the capacity to store up to 6 point 7 million barrels of oil. 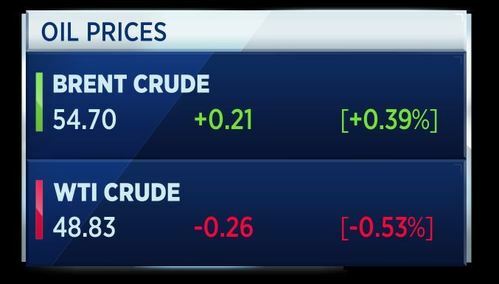 The oil price has been in the grip of Hurrican season with still about 20 percent of U.S. refining capacity remained shut post-Hurricane Harvey. Print taken at 07:10 a.m. Here's one for all you Fed watchers to take note of. 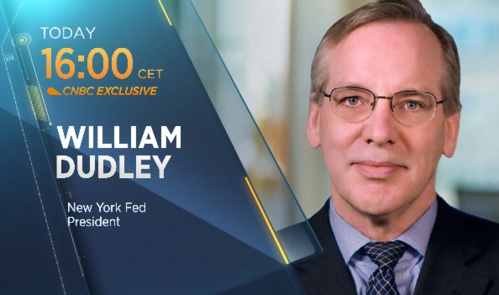 CNBC's Steve Liesman will talk exclusively to New York Fed President William Dudley today at 1600 CET. That is 3 p.m. London time and 10 a.m New York. The earthquake off the coast of Mexico has killed at least two people in the southern state of Chiapas. That's according to Reuters who cite the country's interior minister. Gold is again higher in session but our TV guest host remains wary of it as an investment. It is treacherous to view gold as a straightforward safety asset. It is very volatile and it has no yield. It has very risky properties. Eric Lonergan, Fund Manager at M&G. Gold has been one of the go to safe have assets in recent weeks and has also been boosted by a falling dollar and continued emerging market demand. It is circling around highs not seen since mid-2016. 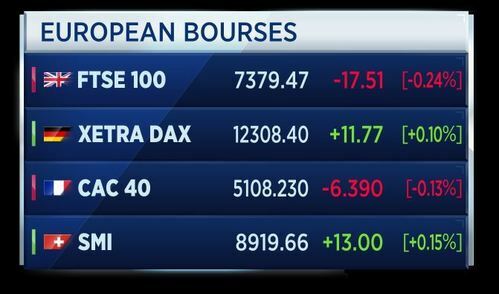 European markets look set for a fall in around 15 minutes time when trading opens. Mexico has been struck by a strong earthquake. The 8.1 magnitude quake was felt in the capital city, forcing people to evacuate swaying buildings. The Mexican interior ministry has confirmed at least 2 people have died. The epicenter is located off the west coast of Mexico, with tsunami warnings issued along the coast of Mexico and some other Central American shores. The Pacific Tsunami Warning Centre has confirmed that a 2.3 foot wave has been observed. Randy Baldwin, geophysicist at USGS National Earthquake Inflation Centre says the region is very "seismically active" as the North American plate and Cocos plate converge at a rate of about 3 inches a year. The average of stocks open lower as we embark on Friday equity trade across Europe. 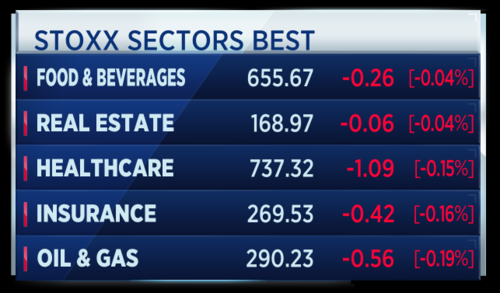 Basic Resources once again open the European equity session as the weakest sector. I might be imagining it but there does seem to be a trend whereby those stocks mildly improve later in the morning. 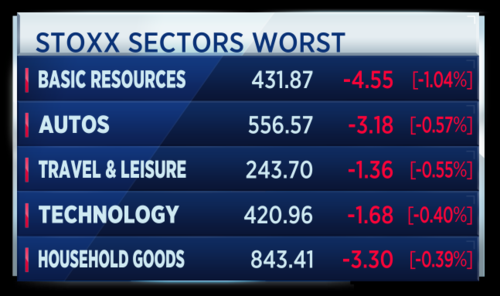 No sectors are currently in positive territory. 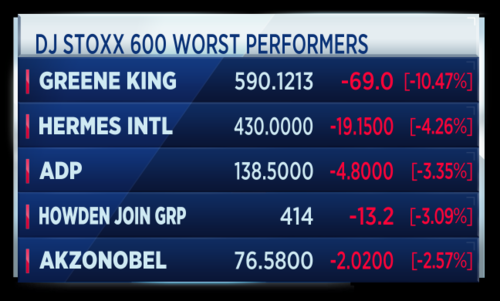 On a stock by stock basis these are your best and worst so far. Electronics company STMicro will replace Nokia in the CAC40. 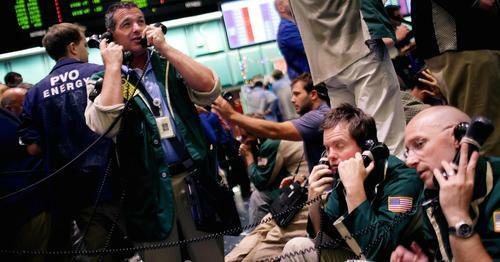 This follows a review by the Paris-based Euronext bourse. The move will become effective on the 18th of September. Dutch chemicals group AkzoNobel has issued a profit warning just weeks after settling a feud with major investor Elliott Advisers over a decision to reject a takeover bid. Additionally, Akzonobel's CFO Maëlys Castella is on a leave of absence due to unspecified health reasons. The Dutch multinational company said Castella will soon return in a senior management position and that it has began searching for a permanent replacement. In July, Akzonobel CEO Ton Büchner stepped down after fending off a takeover by rival PPG. 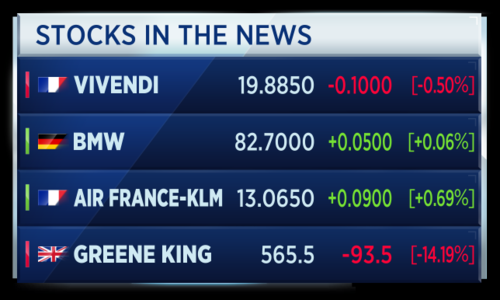 Vivendi is reportedly close to reaching a deal with Italian regulators to reduce its stake in broadcaster Mediaset. According to Reuters, the French conglomerate is going to transfer 20 percent of its shares into a blind trust. Vivendi came under intense scrutiny last year after quickly building up a stake in Italy's largest private broadcaster. BMW has revealed it is preparing to mass produce electric cars by 2020. By 2025, the German carmaker will offer 25 electricified vehicles, with 12 of those being fully-electric. The announcement comes after automaker Jaguar Land Rover said it would produce hybrid or fully electric cars by year 2020. KLM passenger traffic rose over 6 percent in August from a year ago. The carrier, part of Air France-KLM, said it had 8 million passengers over July and August, boosted by strength in its European routes. Earlier we spoke to KLM CEO Pieter Elbers, who told us his outlook for the year remained stable. U.K. pub group Greene King is blaming choppy summer weather for poor sales of wine, beer, and spirits. That lack of fizz enough to slam the FTSE250 firmly to the bottom of the Stoxx600. The company said the trio "had no knowledge that an intrusion had occurred at the time they sold their shares". CNBCThree Equifax executives sold company shares valued at $2 million days after a data breach was discovered, according to SEC filings. 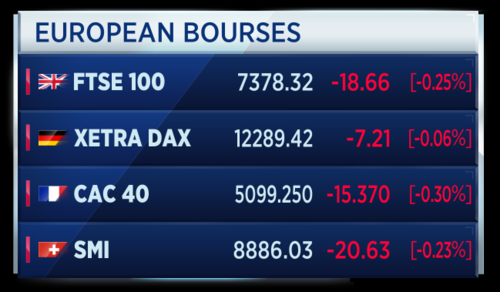 After near enough an hour of trade, the European markets are struggling to make headway. On a weekly basis, only Germany can hold its head up high. At least 5 people are dead after an 8.1 magnitude earthquake rocks Mexico. The Pacific Tsunami Warning Centre has confirmed that waves as high as 3 point 3 feet have been observed. 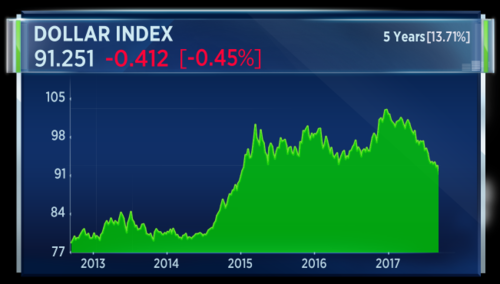 The Dollar Index hits a near three-year low as concerns over Hurricane Irma and ongoing tension over North Korea weigh on the currency. Ireland cannot accept a hard border with Britain after Brexit as it would threaten the peace process, according to the Irish foreign minister Simon Coveney, Reuters reports. Conveney adds that Britain's proposals to avoid a hard border with Ireland have been unconvincing so far. 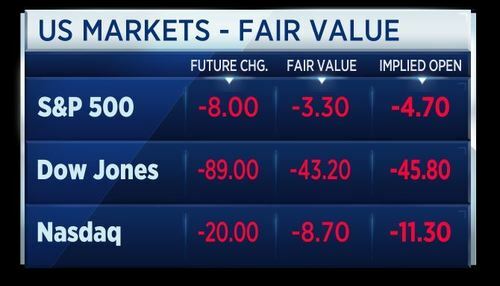 U.S. markets are called to open lower later today, according to future values. This after a tepid session yesterday, with the Dow closing down 0.1 percent, the S&P down 0.02 percent and the Nasdaq making a small gain of 0.07 percent. A data drop for he U.K. The July industrial output has come in at +0.2 percent month-on-month. This after being forecast at 0.2 percent higher. July manufacturing output has come in at +0.5 percent month on month, bettering a forecast of 0.3 percent higher. Trade however not so punchy with the Goods Trade deficit for July sitting at -£11.6 billion. Sterling appears to have held its ground on the release. Print taken at 9:36 a.m. London time. 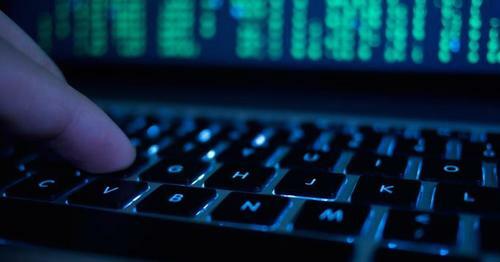 A massive data breach at Equifax means more than 140 million U.S. customers have had their personal information compromised. David Emm, principal security researcher at Kaspersky Lab, says this is another case of a breach becoming public after the incident occurs and underlines the need for regulation. It's to be hoped that the GDPR (General Data Protection Regulation), which comes into force in May 2018, will motivate firms to, firstly, take action to secure the customer data they hold, and, secondly, notify the ICO of breaches in a timely manner. The best way for organisations to combat cyber-attacks is by putting in place an effective cyber-security strategy before it becomes a target. Customers that entrust private information to businesses should be safe in the knowledge it is kept in a secure manner – and businesses should use security solutions to significantly mitigate the risk of a successful attack. There are also other measures that companies can take in order to provide thorough protection, which include running fully updated software, performing regular security audits and performing penetration testing. Consumers have no control over the security of their online providers, but they can mitigate the risk of a security breach of an online provider’s systems. We would recommend that everyone uses unique, complex passwords for all their online accounts, and we would also urge people to take advantage of two-factor or two-step authentication where a provider offers this. 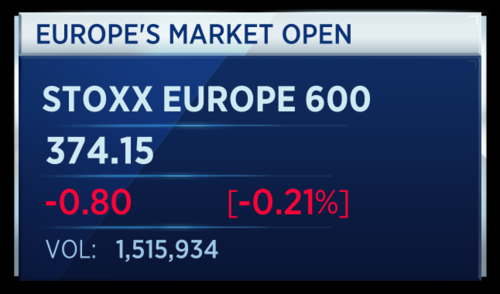 The pan-European Stoxx 600 is down about 6 basis points today. 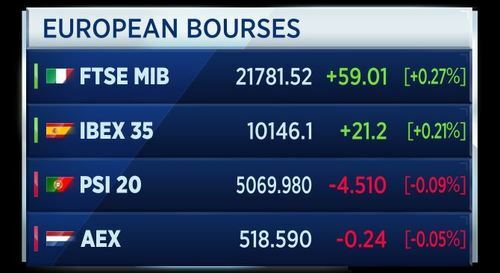 The individual European bourses are more mixed: some posting gains, others posting losses. Goldman Sachs has started to cover the video games sector and it has an attractive view on the market. Electronic Arts gets a buy rating and a price target of $136. Goldman Sachs adds the company to its "Americas Conviction" list. Activision Blizzard gets a neutral rating and a price target of $65. Take Two Interactive Software gets a buy rating and a $118 price target. Ubisoft is given a buy rating, with a price target of 63 euros. Baker Hughes announces its latest rig count data for 2017. The worldwide rig count for August 2017 was 2,116, up 6 from July and up 1,547 from a year ago. The international rig count was 952, down 7 from July. The U.S. rig count was 947, down 6 from July, but up from 481 counted last year. Baker Hughes says the rig count data closed on August 25th, so was not impacted by Hurricane Harvey. 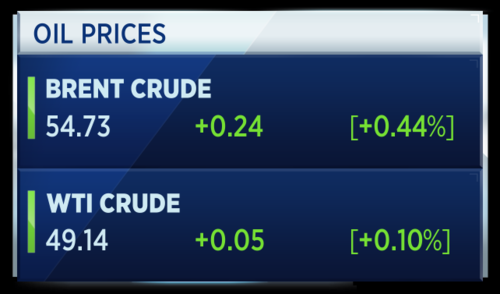 Here's how oil prices are looking today. U.K. construction output fell 0.9 percent month to month in July, which was worse than expected. Year on year it is down 0.4 percent. The downturn is worsening rapidly and Brexit is to blame, according to Samuel Tombs, chief U.K. economist at Pantheon Macroeconomics. Construction output has fallen for four consecutive quarters and now is 3% below its January peak. Faster declines in output lie ahead, given that new orders fell by 7.8% quarter-on-quarter in Q2, taking them to their lowest level since Q1 2014. Both activity and orders have weakened across the board since the Brexit vote. New orders fell in Q2 by 16% quarter-on-quarter in the private commercial sector, but were also down sharply in the private housing and infrastructure sectors (10% and 16%, respectively). Admittedly, private industrial and public sector construction orders jumped, by 11% and 8% quarter-on-quarter respectively, but these increases followed sharp falls in previous quarters. The slump in new orders and the deterioration of the construction PMI in August suggest that output will remain on a downward trend in the rest of Q3. The dollar is in trouble. 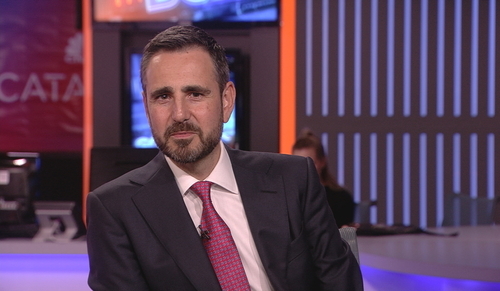 That's the view of George Saravelos, strategist at Deutsche Bank. There are important changes at play outside of Europe that are material dollar negatives. We believe two of these shifts are persistent. First, the market continues to refuse to price additional rate hikes from the Fed, a phenomenon we have termed zombification. This is not about whether the FOMC will raise rates in December but a broader question of what will happen beyond. There are many important changes at play that suggest “zombification” is likely to continue. Saravelos says the forex market is undergoing a shift in drivers. It is no longer been driven by relative monetary policy expectations but an adjustment to flow imbalances that have built up through the implementation of highly unconventional global monetary policy. Part of this imbalance is a structural underweight in European assets which we have written about in the past. More broadly however, Americans are hugely underweight in their investment allocations to the rest of the world. The easiest way to demonstrate this is by looking at American buying of foreign assets. Over the last few years Americans have liquidated close to the entirety of their foreign fixed income portfolio and are likely in the process of re-allocating back to the rest of the world. The shrinking in US-world relative growth differentials and ongoing political turmoil in the US may have helped catalyse this trend. The dollar is under pressure again today. It is down around 0.7 percent against sterling, around 1 percent against the yen and around half a percent against the Swiss franc. 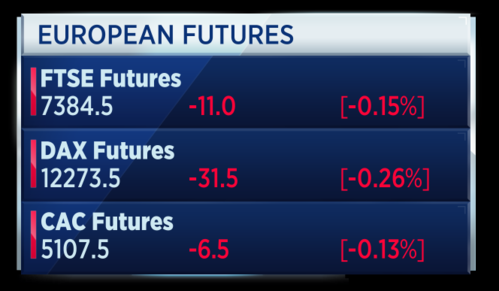 U.S. stock market futures are extending losses ahead of the opening bell. 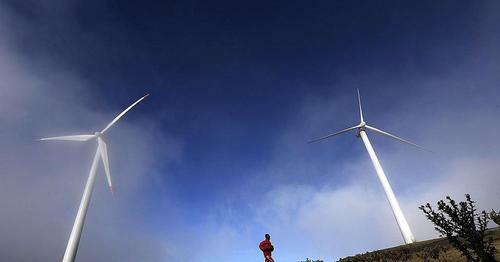 In Kenya, efforts to produce wind power on a grand scale are underway. The Lake Turkana Wind Power project is a 12-hour drive from Nairobi and, once operational, is set to provide 310 megawatts (MW) of renewable power to the Kenyan national grid. "It is the largest wind farm in Africa (and) it has 365 turbines," Carlo Van Wageningen, director and board member at Lake Turkana Wind Power, told CNBC's Sustainable Energy on Thursday. In Africa, efforts to generate wind energy on a grand scale are underway. 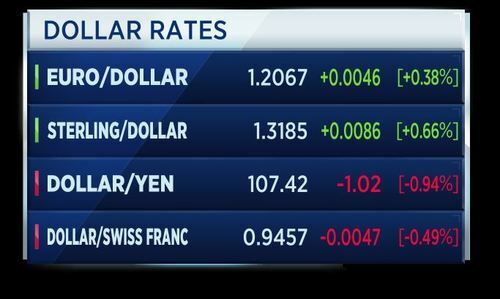 The euro is continuing its bullish run thanks to the ECB and the dollar is struggling, according to Paresh Davdra, CEO and co-founder of RationalFX. President Mario Draghi yesterday highlighted the monetary authority’s plans to reduce bond purchases next month and said that the ECB will decide on the “calibration” of its policy beyond 2017 this Autumn. This acted as a stimulus to the currency, continuing to propel it against the dollar. A stronger euro makes exports from the eurozone more expensive in other countries, and is likely to dampen domestic inflation (because imports are cheaper). 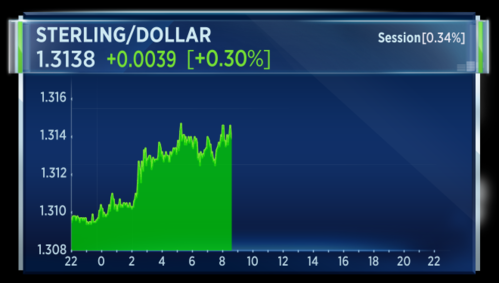 The dollar lost ground against other major currencies yesterday after weaker than expected U.S jobless claims data. The U.S. Department of Labour yesterday reported that the number of individuals who filed for unemployment insurance for the first time during the past week rose to 298,000, up from 236,000. Analysts had initially only expected the figure to increase to 245,000. 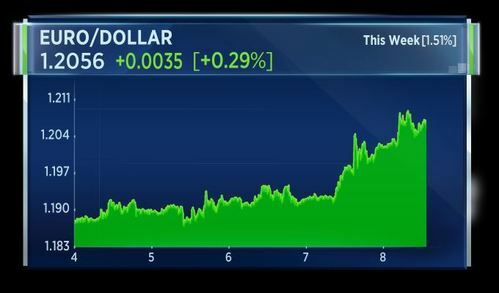 The release of the data caused USD to lose the momentum that it had received on Wednesday after a new deal between the Trump administration and the Democrats in Congress to extend the debt ceiling. The euro has gained 1.51 percent this week and is above the 1.20 handle. Latvian economist and member of the ECB Ilmārs Rimšēvičs says he agrees with Mario Draghi that inflation in the euro zone could reach its target in 2020. French automaker Groupe PSA has been accused of equipping 2 million vehicles with emissions manipulation software, according to a report by Le Monde. The allegation comes from the French fraud watchdog, but the company says it has not been contacted by the judicial authorities. Groupe PSA denies any use of diesel engine cheating technology. Shares in the company are down sharply on the news. 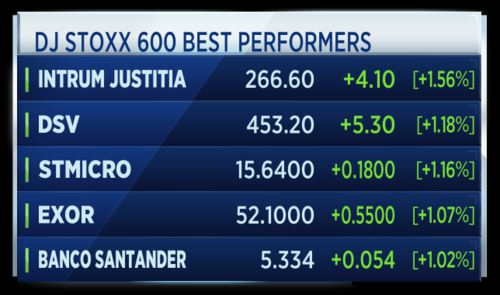 These are the stocks moving in premarket trade ahead of the U.S. opening bell. One stock in focus is Equifax.The credit reporting agency revealed a massive data breach that exposed personal information of as many as 143 million consumers. The company also said three executives who sold shares days after the breach was discovered were unaware of the event. ECB policymaker Philip Lane says the accommodative stance will stay until the central bank sees evidence inflation is on a sustainable path towards the central bank's target. Lane says the ECB has accumulated a big stock of bonds at this point. Credit Suisse has tipped U.K. equities to underperform. The Swiss bank's investment committee has made this call even as views a "Hard Brexit" as less likely. 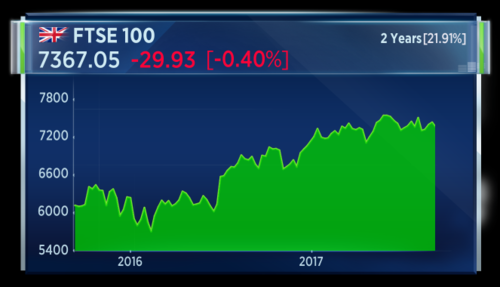 U.K. stocks have enjoyed a strong run since June, 2016. Meanwhile, the National Economic Institute of Economic and Social Research has said the Bank of England might well raise rates in early 2018, due to a pick up in GDP growth. The forecasting body said the UK economy likely expanded at 0.4 percent in the three months to August. This woudl double the rate of growth seen in the three months to July. Kroger reports second quarter sales of $27.6 billion, beating the IBES view of $27.49 billion. The company confirms its 2017 net earnings guidance of $1.74 to $1.79 per share.